What better way to start the new year than feeling refreshed in your own home? Here are 5 easy steps to help you feel refreshed! It’s cold and gloomy outside. No better time to do it! I must admit that taping ceiling is not my favorite thing in the world, so if you’re interested in improving your painting skills and saving some time look up this super helpful video on how to cut a straight line. I also highly recommend handy dandy brush from Home Depot. Even if you’re painting the exact same color you’ll be able to tell the difference a nice and fresh coat of paint can make! Don’t be afraid! The worst thing that can happen is you’ll have to move it back. But sometime moving a piece of furniture a few inches here and there can make a great different in a flow of a house. You can start with something as small as swapping a picture from one room to another. Spray paint is a great way to revamp some pieces of decorations. 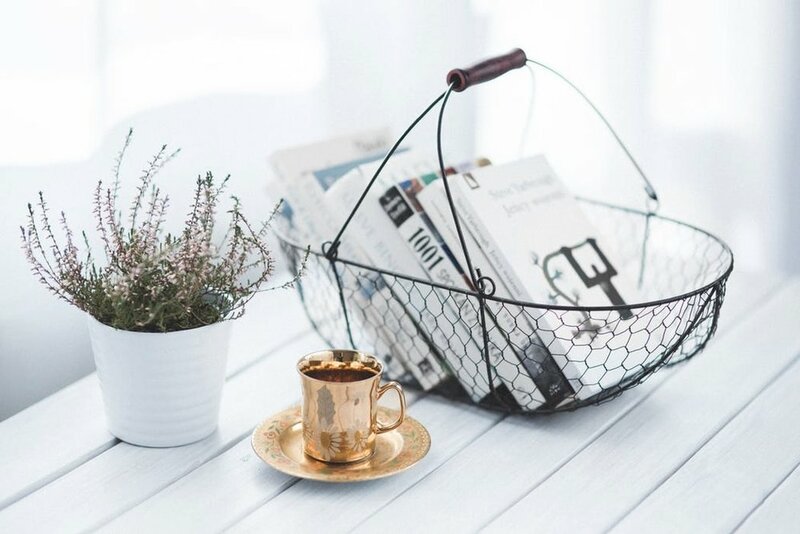 Think about items that aren’t handled on a daily basis, like a lamp base, decorative vases, bookends and other small things. It's a great way to give an older item a new look. I was not born with the green thumb genes and I live in one the places with the LEAST amount of sunshine so it’s not very easy to find one that thrives in my house. Even though I’ve had my failures I continue to try. Indoor plants can not only hide awkward corners, add visual interest but they refresh and purify the air. Triple bonus! Would love to hear your thoughts on this. What do you do to refresh your home every once in a while? Sign up with your email address to receive news and updates from awesome blog posts like this one in the future! Last year I decided it was finally time for me to do the thing I've been telling others to do. I built a whole business around my main belief that we should only surround ourselves with things that either brings happiness or serves a real purpose. After reading The Life-Changing Magic of Tidying Up and watching the Minimalists documentary I was inspired to make a significant change. Having my second child brought me so much joy alongside a never ending feeling of being overwhelmed. I felt that I was cleaning and picking up after my little humans all day long without having the proper time to focus on myself and my business. I was looking to really simplify my life so I wasn’t spending all my time cleaning, cooking or changing someone’s diaper. And let me tell you, this process has REALLY helped take back control. I have been able to do the things that are important to me and started be the best version of myself every day by only wearing my favorite things. The main lesson I got from examining my belongings one by one was having this sense of urgency in dealing with things seemingly unimportant. For someone that procrastinates as much as I do, this was life changing. I realized there was a pattern in my life in the way I dealt with putting things away in the past. Whenever I came across something out of place, I would quickly stash near the closest bin or basket available and that created a lot of frustration and anxiety trying to find specific items at times. Now, instead of having FIVE possible places where I stored scotch tape there’s only ONE. Everything has a designated place and putting it away is SO MUCH easier because I know exactly where to put and where to find when I need it. This may sound really small and even silly but when you are already feeling overwhelmed, not finding that scotch tape to wrap presents on December 24th can literally bring someone to tears. I have learned to deal with things as they come. It’s not always big, in fact many of these things are so small and mundane that it’s hard to believe I haven’t done anything about it before. A perfect example is the amount of daily emails that I’m automatically subscribed to and do not care to receive. As these emails come, instead of deleting only to receive another one next week I take the extra 3 seconds to hit that beautiful and tiny “unsubscribe” button. And that folks is LIFE CHANGING! But seriously, opening up my life to only having things that spark joy in me has opened up my heart and mind as well. If you haven’t read this little book yet, I strongly recommend you do so and start living the life you envision for yourself. I love the end of a year because we can contemplate about the great things we've done and the greater ones we want to accomplish. It's a time to gather with family and friends and be grateful. It's also time to eat LOTS of yummy treats and decorate your house like no other time of the year! So I pulled together some of the top trends going on this year just for you! Less is more is becoming true to more people each year. 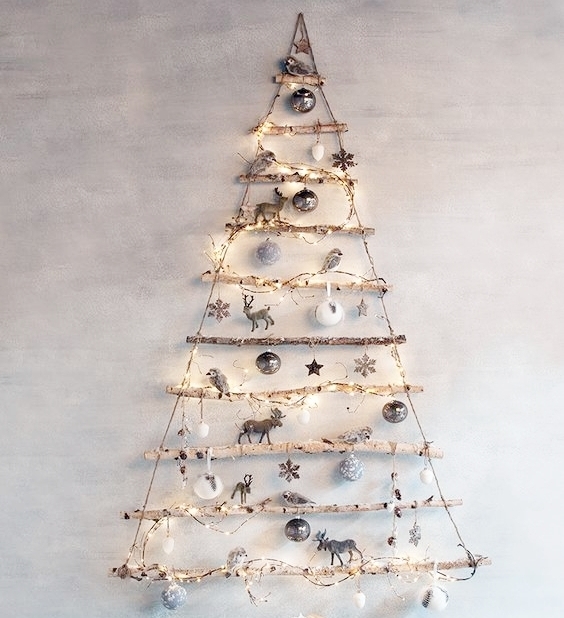 I't's no surprise that alternative/eco-friendly christmas tree options are one of the most searchable inquiries on Pinterest and Etsy this holiday season. There's something so simple, classic and chic about combining black and white. This is the complete look for a modern and masculine feel with less frills but with some feminine lines here and there. This is another trend I can truly get behind! Knit is so classic and it'll ALWAYS look great during this time of the year. No need to worry replacing these spendy bad boys next year! Gone are the days where you can just grab a roll of gift wrapping on your way out from holiday shopping. This year's trend of creative gift wrapping is beautiful but just not for me. My kids will be lucky to have their gifts wrapped -at all- On that note, Merry Christmas y'all! 2018 Color predictions are in!! A surprisingly common denominator between them is the political tension brewing around the globe. Bold, serenity and simplicity are a few adjectives you can find in the 2018 picks. Top paint companies predict each year's color trends by picking up cues and influences from different industries, including fashion, art, and even politics. Once all that information is gathered they are able to see common threads in between these different disciplines and areas of the world. Expressive and Bold 2018 Color of the Year. Like so much else of the present moment, Benjamin Moore's choice was unapologetically strong-willed. It transformed the National Mall into a sea of color at the Women's March in January, it starred in hit TV shows from the eerie Twin Peaks to the somehow eerier The Handmaid's Tale. It stomped down practically every runway in February and stampeded onto the streets come September. Benjamin Moore director of strategic design intelligence Ellen O’Neill, stated: "I think it’s voice. Red is a radical choice for a color in a room. But I guess it comes back to being bold, and you kind of have to be bold right now to break through the clutter of all this messaging that doesn’t maybe feel or sound right. Dark rooms can be very seductive. We discovered examples of the comfort red brings—the cocooning, the assuredness. If you’re out there and you’re afraid to turn the television on at night because you don’t know what’s coming, you’re in this secure red space in a way that’s grounding and enveloping. It’s a place to retreat and not just be out marching." "Green-blues in deep values, such as Oceanside, respond to changes in light, which is a quality that creates intense dimension," says Sue Welden, the director of color marketing at Sherwin-Williams. “It is a tremendously versatile color, and harmonizes with other diverse color groups." The color—rich, deep, and complex—is a bridge between the familiar and the foreign. It's an exciting choice that experts perceive as intelligent, honest, and interesting, which both boosts creativity and brings clarity to its surroundings. This cool, tranquil, spruce blue is inspired by nature and is a soothing, restorative coalescence of blue, gray and green. This comfortable color evokes a sense of sanctuary and relaxation amid our busy, always-on lives. In name and color, this hue speaks to our desire to take a break, be present and recharge. In The Moment is versatile and perfect to use for both interior and exterior projects. It also crosses multiple design styles, ideal for working with traditional, modern, coastal and global décor. The shade speaks to our society’s desire to disconnect and be present, evokes a sense of sanctuary and relaxation amid our always-on lives. A no-fuss shade of black that encourages a "less is more" approach to decor. It almost has a chalkboard-like look to it, which is why it doesn't feel too harsh when seen on walls and the floor. Just make sure you pair this color with light furnishings, as seen here with natural wood chairs and a white statement lamp. Why should you hire a designer? It’s taken me many years to gain perspective and clarity as to what being an interior designer actually means for my clients and myself. I will break down a few of the reasons why I believe interior design might be beneficial to you. It’s SO EASY to scroll through interior design pictures and see a million things you like. The hard part is distinguishing WHY you are attracted to certain things versus others. When you work alongside a designer their main goal is to get to the bottom of your style. Through my design process I make sure to ask some really fundamental questions that will later on help me if we get in a road block and can’t seem to make a decision on something. For example on my initial questionnaire one of the questions is to describe how you want your space to feel, If they choose adjectives like, comfortable, relaxed and cozy, those words go straight into my client folder and every time I’m sourcing an item or pitching an idea those words are at the top of my mind. A designer's job is to translate your dream home into reality as well as expose you to things that enhances your vision. "You're right I do need a Pinterest intervention. Let me go look on Pinterest for some ideas"
We’ve all been there before, pinning a million pictures on Pinterest saving for the one day when we’ll wake up and magically have a ton of spare time to make our homes perfect in the way we’ve always envisioned. However if you’re anything like me, life tends to get in the way of those pins. Babies are born, dinners need to be made, laundry folded… You catch my drift? That’s where a designer comes in and saves COUNTLESS of your own hours doing research, purchasing, dealing with returns, damaged items, furniture assembly and managing the project so you have all the things you need in order to achieve your vision in a timely manner and within budget. A harmonious design pulls pieces from various vendors to achieve a cohesive look and focus is essential for that to happen. From choosing the perfect shade of color with just the right undertones to planning out structural changes and project management. An interior designer can help to break down the process into easy steps to achieve your overall vision. Too many choices are overwhelming, an interior designer is able to pick the top choices for your project and make your decision making MUCH more manageable and enjoyable. Every project needs a process and that’s just a way to describe a flow of things. If step 1 isn’t done properly that affects the following step. Ultimately interior design ends up being much more than just aesthetics, it has a lot to do with the whole process of achieving a desired look. A great designer will have a set of their own steps laid out so you know exactly what to expect and when. I am a mother of two beautiful children, wife to the most amazing/supportive husband, only child to the most selfless parents, business owner, podcaster and lover of coffee, red wine and cheese. I am a major home body, live for summer time and my favorite things to do are spin/yoga classes, listening to a great book/podcast or spending quality and intentional time with my family and friends. I was 16 years old when I packed everything I owned in one luggage and moved from Brazil to live with my dad in L.A. It was one of the hardest things I have ever done to leave everything and everyone I knew behind but it was also fundamental for my personal growth. Moving to the U.S. also brought me to the love of my life who ultimately convinced me to leave sunny California to follow him to the Pacific Northwest. The first winter was ROUGH but I found that as long as we sneak out to a warm weather vacay during the winter it makes it more bearable. Luckily we have amazing family in Brazil and L.A. that graciously hosts our rambunctious little family for a break from the winter. My business began after the birth of my first child and it is a decision that I will never regret. Becoming a mother and business owner has changed me in more ways than I can count. It has given me the opportunity to self analyze my own life and come to the conclusion that if I’m not helping others in a meaningful way I’m not doing the job I intend to do. Each day I try my best to make a difference in the world by setting an example to my children of what a loving home is. I truly believe we each have a set of special skills we are meant to share with the world. My personal mission in life is to elevate others around me and leave everything and anything in better shape than I found them. 4. I can only set alarms at odd numbers. You can follow me at fernanda.bertrand on Instagram or subscribe to my newsletter to keep in touch!